When you add a new event to your Teamup calendar, the window that opens is called the event editor. In the event editor, you can customize the details of your event, set details for scheduling and recurrence, and upload images and files. The event editor is easy to use and full of features. The title bar: set the title of your event. The title will show up in the Calendar View. The date and time settings: set the start and ending dates and times for the event. If the ‘All day‘ box is checked, the time settings will disappear. The calendar selection: Click in the text box and a drop-down menu of your sub-calendars will appear. You can mouse or arrow down to select a sub-calendar. You can also type in part of a sub-calendars title, then press Enter to select it. An event can be assigned to more than one sub-calendar. The event fields: By default, the event editor includes event fields for Who, Where, and a Description. Calendar admins can add customized event fields; delete, deactivate, or modify event fields; and rearrange the event fields to appear in a customized order. The description box: This is the most powerful event field, with a full text editor and the ability to insert images and files. Menu buttons: When you first open the event editor, only ‘Save’ and ‘Options’ will appear as menu buttons. Once you save the event, ‘Share‘ and ‘Options’ and ‘Delete’ menu buttons will also appear. In ‘Options,’ you can enable Comments and Signups for the event. Note: if you don’t see Comments or Signups under ‘Options,’ check Settings (or ask your calendar admin to do so). These fields can be disabled in Settings and, if disabled, will not appear in the event editor. The event reminders feature is only visible if you are logged in to your user account. To access event reminders, create a Teamup user account. 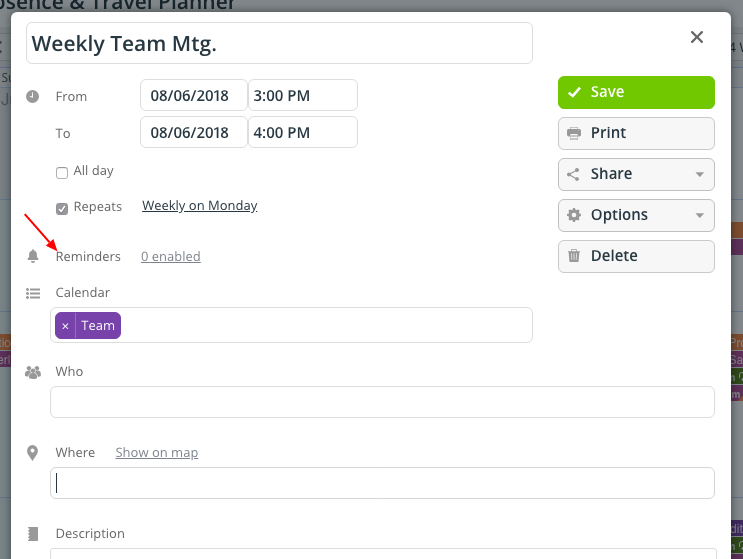 Then open your calendar while logged into your Teamup user account. 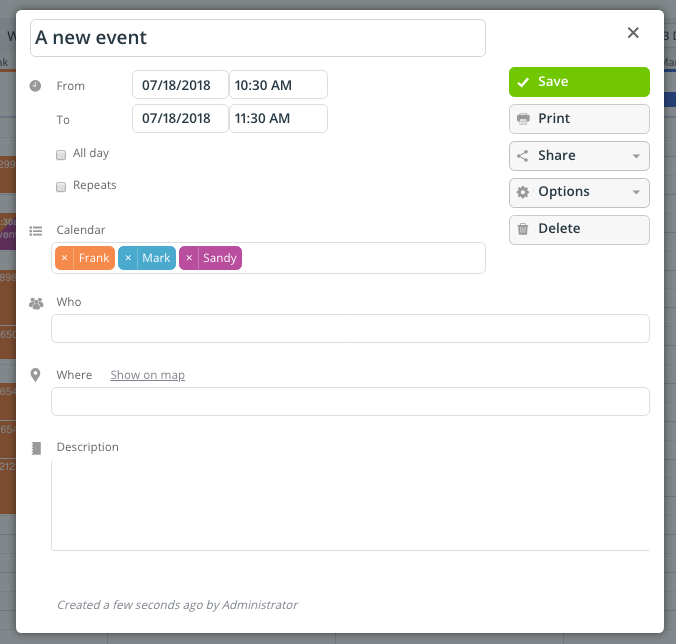 Click to create or open an event and you will see the Reminders option in the event editor. See more about user accounts. The event editor is only visible to users with a modify permission. Other users, with read-only access, will see an event viewer when they click on an event.